Almost a month after we first reviewed Arundhati Roy’s much-awaited novel, we revisit the tome to analyse it from a socio-political lens…. Ignore the inescapable media hype. Discard the preconceived notions. Battle the inexorable prejudices that lie within. Try, but it will be difficult to do all this and more, because for an Indian, reading a work of fiction by an Indian writer is unwantedly familiar. The reader, more often than not, carries the same burdens as the writer. The reader knows the code language the writer has adopted to turn fact into fiction. Yet, I hearken back to what Arundhati Roy has written before, “…the secret of the Great Stories is that they have no secrets. The Great Stories are the ones you have heard and want to hear again. … They are as familiar as the house you live in. Or the smell of your lover’s skin.… In the Great Stories you know who lives, who dies, who finds love, who doesn’t. 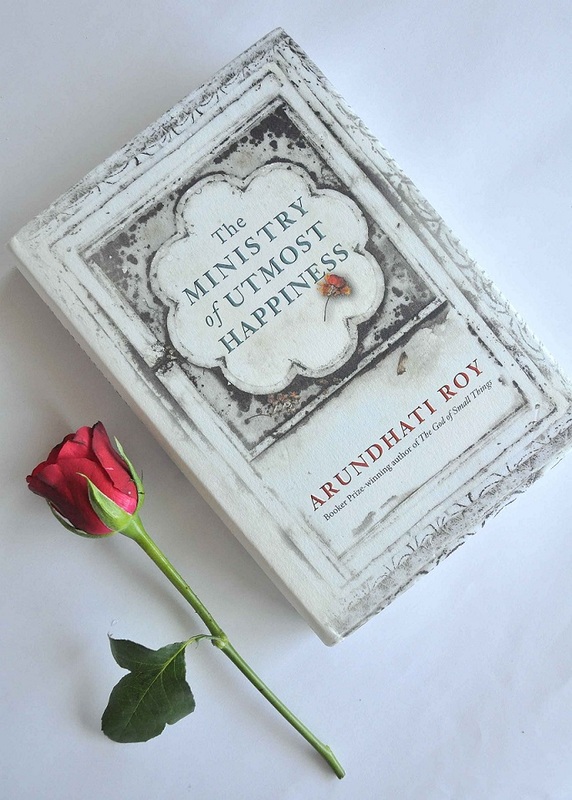 And yet you want to know again.” And that is what The Ministry of Utmost Happiness is – a Great Story. The novel, perhaps more relatable and somehow yet more distant than Roy’s maiden venture, tells more than one story. It tells of a colourful range of characters hitherto unimaginable on any canvas other than India. And yet, it feels that the palette has been tinged with a hardened reality which is precisely what makes it relatable to us and our time. The characters are effortlessly interwoven with the political milieu and motivations of India over the past couple of decades – the time Roy spent writing this novel, since God of Small Things fetched her the acclaimed Booker Prize. Through it all, Roy paints the pictures of every political event that has shaped the geography of our country, providing (affectionate? acrimonious?) nicknames to each relevant member of the raajneeti. Whether these are just another literary brushstroke, or a well-planned device to evade defamation suits, is left to the reader to pick his version. But one thing is clear – Roy makes no apologies for the unmistakable identification her pseudonyms provide. We are taken on a journey which shows us a diverse world of Delhi’s eunuchs via Aftab, who soon becomes Anjum, referred to as a ‘hijra’. She refers to her gender identity confusion as her inner Indo-Pak – an internal conflict that has no solution in sight. She meets an unusually-named Hindu Chamar who is shielding himself from his own history of demons. They meet Tilo, a mysterious kidnapper of a baby from Jantar Mantar, the venue of unfulfilled promises. The mystery is unravelled to the reader through the eyes of her three lovers – at first, all members of a theatrical production, and then, each forming a different vantage point of Kashmir. I inwardly wished, for a moment, while reading this book, that I were not an Indian. That I didn’t know and feel the wounds Roy blatantly evokes, that are forever etched on the flesh of my motherland. That I didn’t know what happens across the country – in Kerala, or Andhra Pradesh, Kashmir, or Delhi; that I could read Roy’s second outing as just what it is, a Great Story. But, perhaps, if I weren’t an Indian, I wouldn’t have been able to smell the dusty streets of Old Delhi which flow with blood on Eid, nor recognise the Himalayan forests, with its Chinars on fire, nor understand fully how Tilo felt when she had to flee the horrific ordeals of Kashmir only to end up feeling utterly out of place in the capital’s diplomatic enclave. This story has been told using redolent imagery so strong that it transports you first-hand alongside the characters and the 20 years they experience. Several starkly real moments come, as a genius writing tactic, in the form of letters or stories within the novel – a late one being a letter from a raped, tortured Communist woman, born illegitimate, on the East Godavari district of Andhra Pradesh, with a threat to break up Anjum’s bliss. One lands up rooting for them as they camp together in a shanty of a lodging house erected on a burial ground, and laconically called Jannat; but one also mourns for their losses and their heartaches, which are only partly cured by the subtle flavour of magic realism Roy imbues in her characters’ endings. Reader and characters both feel at peace as new lives commence at a graveyard.